I had the pleasure recently of adding another Nutanix Platform Professional Certified person to our family. My eldest Son Sebastian (8yrs) successfully passed the exam after a lot of studying and some hands on experience. He is currently the youngest person to have completed the certification. The NPP certification verifies the skills necessary to install, configure, and perform basic troubleshooting of the Nutanix Virtual Computing Platform. Ever since Sebastian was old enough to use a computer he was hooked (prior to that it was the iPad). From about the time he was 4 or 5 years old I was teaching him about virtualization, computers, and what I did for a job. He wrote a paper for his teacher in his second year at school (as extra homework) describing all the inner workings of a computer and my wife got me to check it for accuracy, which to her surprise it was spot on. I recall he once said to me “Why would anyone ever run a physical machine when you can run a virtual machine?” This is classic millennials. He has also helped me out a lot with remote troubleshooting while I’ve been out of the country and I’ve needed a pair of hands at home. For example when I needed to do some switch troubleshooting as I covered in Switch Debugging via Console Cable Connected to VDI Desktop from 9000 Miles Away. 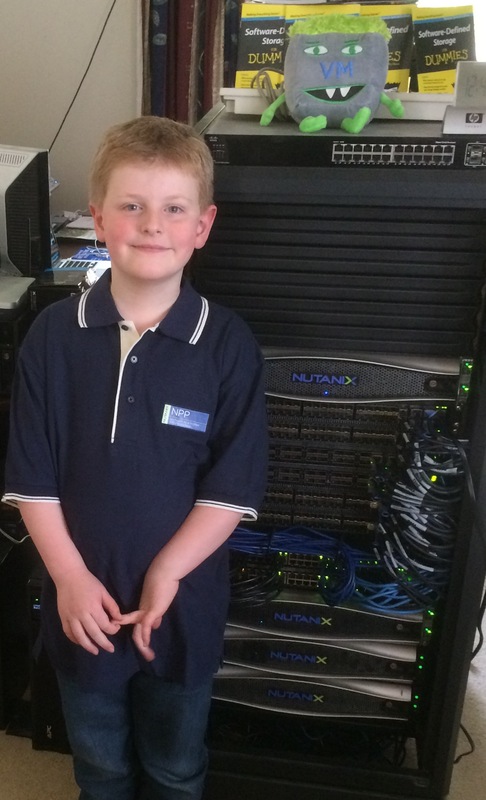 So when he showed an interest in Nutanix I made sure I showed him how easy the platform is to set up and manage. Sebastian showed a strong interest to learn more so I asked if we could sign him up for the online Nutanix Platform Professional training, which he duly completed and passed the NPP Exam. Here is an interview I recorded with Sebastian after he completed the NPP certification. Q: What made you decide to attempt the NPP Certification? A: I was interested in Nutanix because it would allow me to play with all my Dad’s equipment and learn about virtual machines. Q: How did you find the online Nutanix Training as a preparation tool for the exam? A: I found it easy to follow, but some of the terminology was a bit hard and I had to ask my Dad for help during the training to explain some of the words. I had to learn all about disaster recovery and fail over and fail back and it was the first time I’d done that. Q: How much experience did you have with IT and virtualization prior to doing the Nutanix training? A: My Dad has always had a lot of computer equipment at home and I’ve always had an interest in computers. I’ve always had access to computers and I started creating my first virtual machines using Virtual Box and VMware Fusion a couple of years ago, and my Dad gave me access to one of his test labs to create VM’s with VMware vCenter. Virtual Machines are cool because you can run any operating system you want, and change the size of a VM at any time. Nutanix just makes it so much easier to run lots of Virtual Machines and it’s really fast. Q: How did you find the NPP Exam, was it hard? A: In terms of questions yes, it was hard, but in terms of time, I had heaps of time left over. Q: Did you find that the online training gave you the preparation you needed for the NPP exam? A: The online training was great, but it was also good to have hands on experience with a real environment. I really liked working through the training with my Dad. Q: What does it feel like being the youngest person to have successfully passed the Nutanix Platform Professional Exam? A: It’s really cool. Because I got lots of prizes, like a NPP Polo shirt. Author: I have also set him up with his own home lab on some old servers I have lying around. Q: Now that you have passed NPP what will you do next? A: I want to do really well at school and when I learn more about computers I’d like to do the VMware Certified Professional Exam. Q: What do you like most about the Nutanix Platform? A: It is really easy to get the cluster set up and running and you can replicate virtual machines to remote sites and then fail over and fail back. It has lots of storage and it’s really fast. I like to watch my Dad run performance tests. Nutanix makes infrastructure that anyone can use. The platform is simple, as IT should be, so you can focus on your applications and business value. The fact that a smart 8yr old can pass the exam is testament to Nutanix achievement in consumer grade design for highly available web scale enterprise robust IT infrastructure. Needless to say I’m very proud of Sebastian’s achievement and the effort and dedication he put into learning the Nutanix technology and successfully passing the exam. It makes me think we should be starting professional IT training a lot earlier in schools. Congrats Sebastian!!! Great achievement! Your father must be proud of you! It is always a pleasure and lot of fun when son and father have the same passion. My son is just 2 years old so he is currently interested just with iPad 🙂 Hope to build similar IT team with him soon. Thanks for the comment David. Sebastian also has an interest in programming including PowerShell and SimpleBasic. I need to introduce him to Bash and vi at some stage as well.